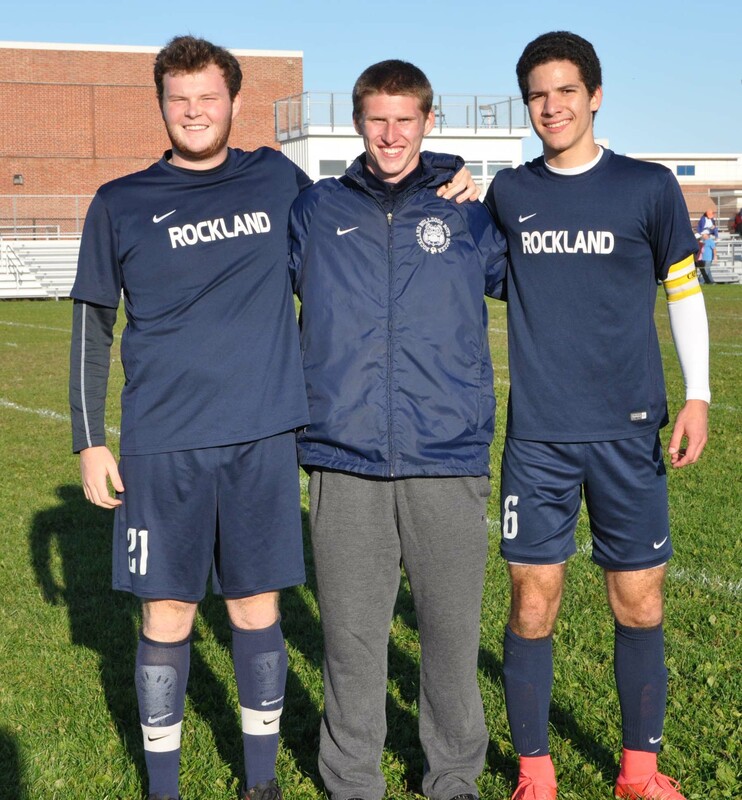 As the school year began at Rockland High School, a new-look boys’ varsity soccer team kicked off their season. The Dogs returned just three starters from last year’s record-breaking team that was led by Jake Crawford, Darcy Guimaraes, and Jeff Donahue, all of whom are now playing college soccer. Despite losing some great talent from last year’s team, the Dogs are confident with what they have and have shown that when everything is clicking, they’re a team to be reckoned with. Senior captain Mark Shields believes playing comfortably as a team and being positive will be the key to reaching their full potential. “Sometimes we hurt ourselves by overthinking things on the field. We just need to be comfortable with each other and constantly supporting our teammates,” said Shields. With all the new components to the team this year, the Dogs are getting quality play from many different players. Collectively, the defensive unit, consisting of seniors Matt McGaffigan, Connor Cleaves, and Ryan Kirby, as well as freshman Nick Blonde have played well together, according to Coach Kimball. Although the Dogs on paper have a talented and skilled roster, it hasn’t exactly correlated onto the field all the time. Twelve games into their season, the Dogs sit at a 5-4-3 record. Two of their losses have come against two skilled and powerhouse teams in Cohasset and Division I Brockton. The focus for the team is to succeed in the areas of the game that they can control, like effort and passion. “[We] need to focus on having passion when challenging 50/50 balls,” said Kimball. A bright spot for the team this season is senior Joe Campanile between the pipes. In Campanile’s first season playing soccer he has stepped in as the team’s starting goalkeeper and has done a phenomenal job. The new goalkeeper is ecstatic with the team and the sport. “I like the players, I like the coach, and I love the sport. This experience is great and I hope I can help my team to the tournament,” said Campanile. The Dogs have a lot going for them for the remainder of this season. Through the first twelve games the Dogs have played well despite being without senior captain and all-star Liam Lenihan. Their most recent game a 1-1 tie at Mashpee, was highlighted by Jon Alvarenga’s goal and Joe Campanile’s excellent play in net. With many new faces and components to the team, there were many things to figure out heading into the season. As chemistry builds and players get healthy the team will get even better. Expect the Dogs to find their groove and to march into the state tournament. They have the team to do it. Senior Ryan Kirby goes after the ball against Hull. Sophomore Andre Coste in Hull game.